This week I was back on the trail of bugs again in dad's back garden, and came across this interesting looking creature. 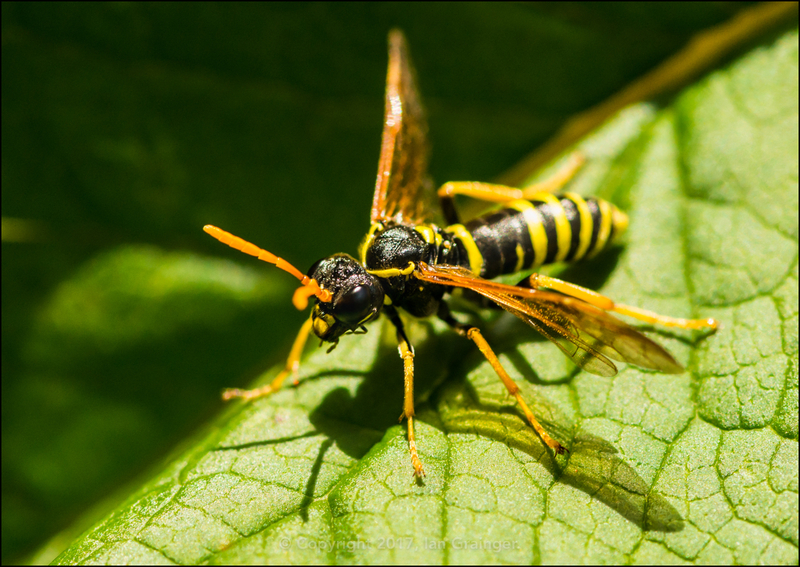 It's another one of those insects that styles itself on a Wasp, but is actually a Sawfly called the Figwort Sawfly (Tenthredo scrophulariae). 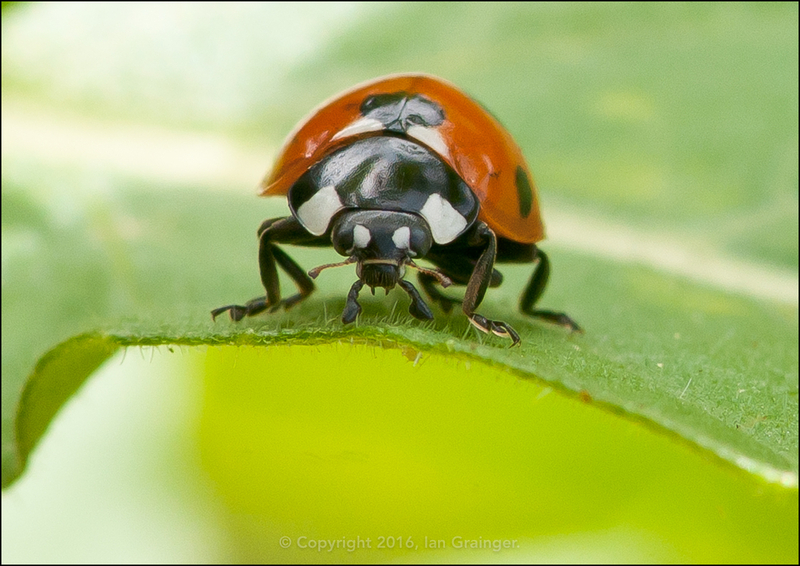 I don't remember ever photographing one before, so I was quite pleased to get such a decent close-up of this one. 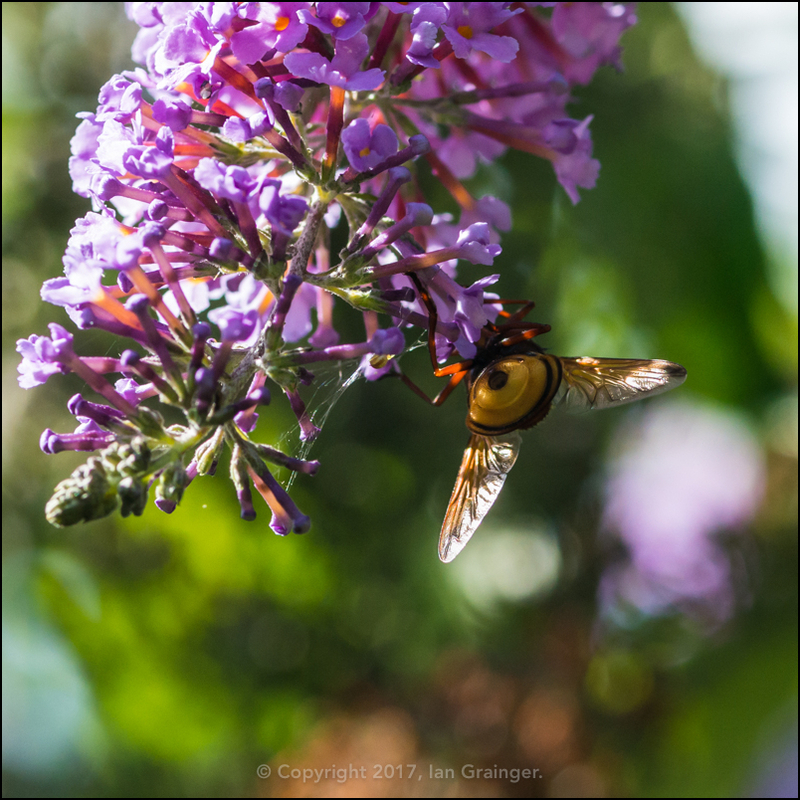 The Butterfly Bushes (Buddleia) seemed to be where all of the insect action was taking place this week. 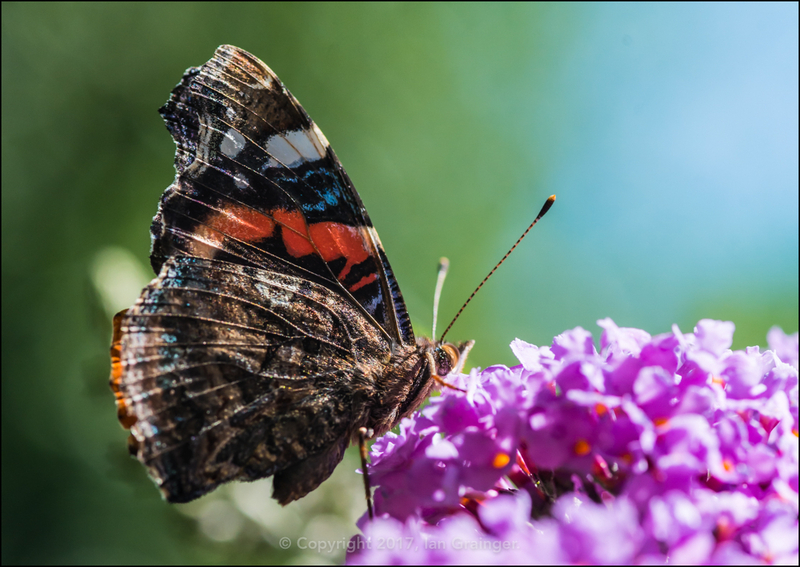 I thought that the underside of this Red Admiral's (Vanessa atalanta) wings were looking very colourful in the early morning sunshine. ...as were a number of these large Hoverflies (Syrphidae). This one, annoyingly, wouldn't turn to face the camera. 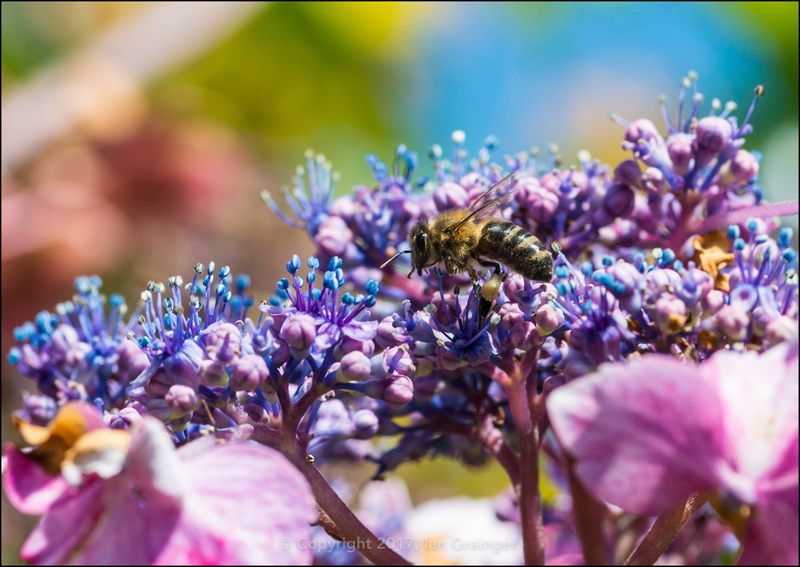 This busy Bee (Apis) preferred the little blue blooms of a Lacecap Hydrangea Bush (Hydrangea macrophylla), which were looking at their best at this time of year. 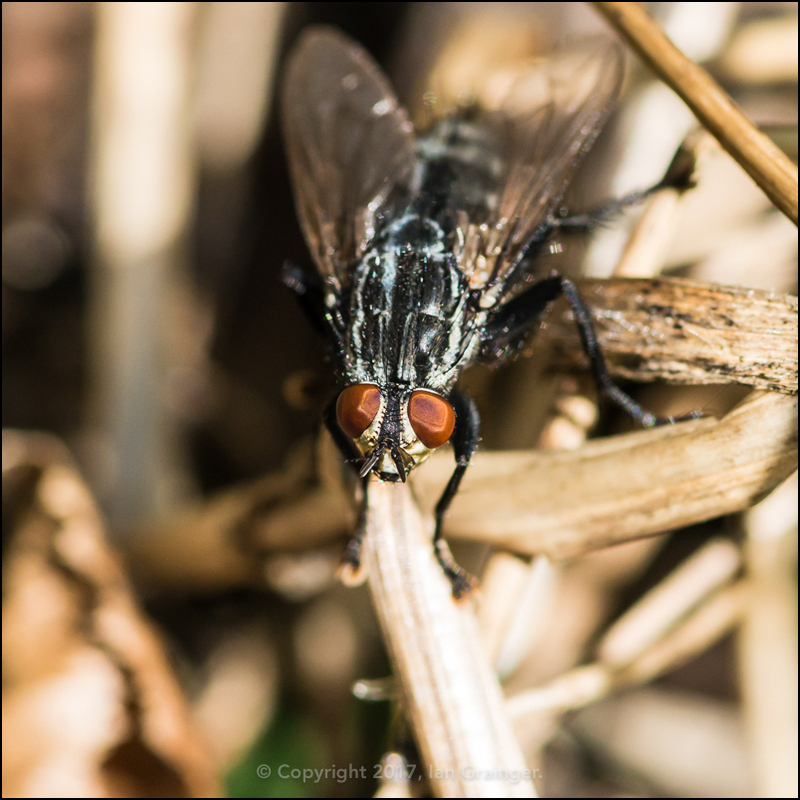 Meanwhile, the Flesh Flies (Sarcophaga carnaria) seemed to be happy anywhere there was some sun to warm them through. This one preferring some old dried grass to sit on. 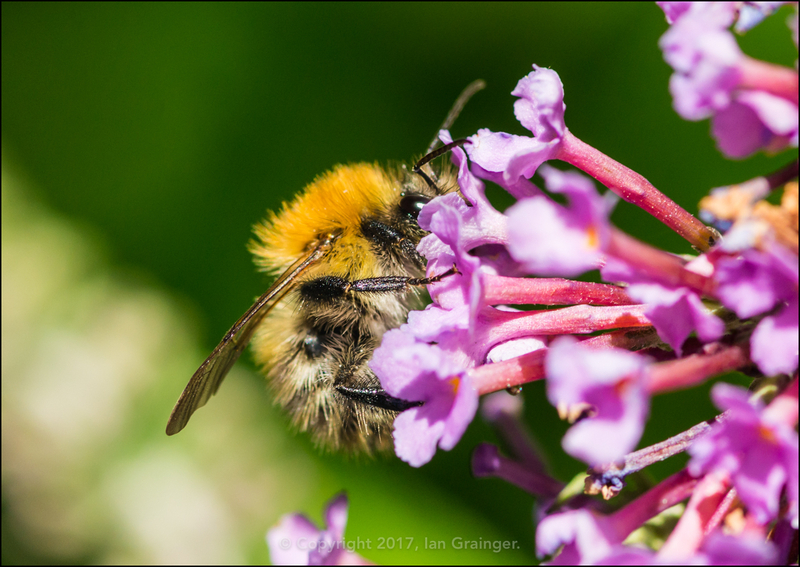 If you're interested in taking photographs of insects, you may want to take a look at my tutorial. Entitled Insect Safari, it explains the equipment and techniques I use to locate and photograph insects. Why not click on the link to check it out? Looking skywards, there wasn't much avian action this week, as I suspect it was a little too early, and a little too chilly, despite the beautiful blue skies. 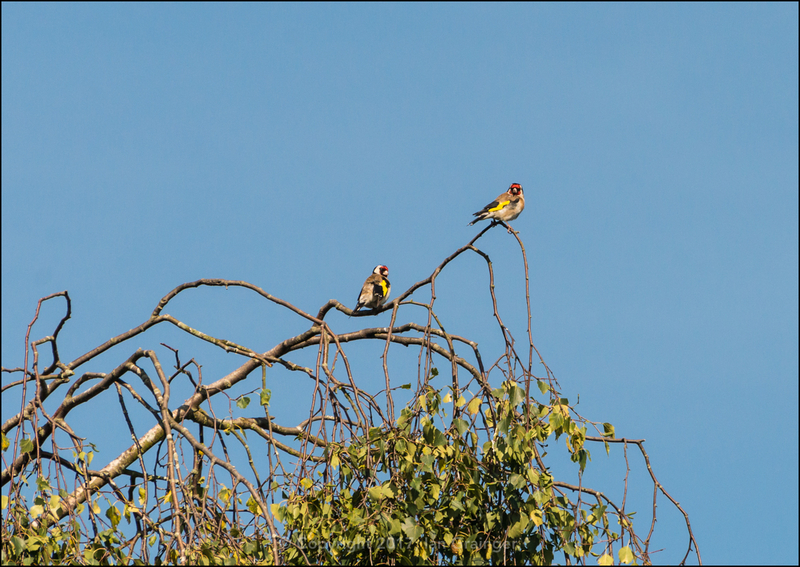 The resident Goldfinch (Carduelis carduelis) group seemed to be the only birds braving the cooler conditions. 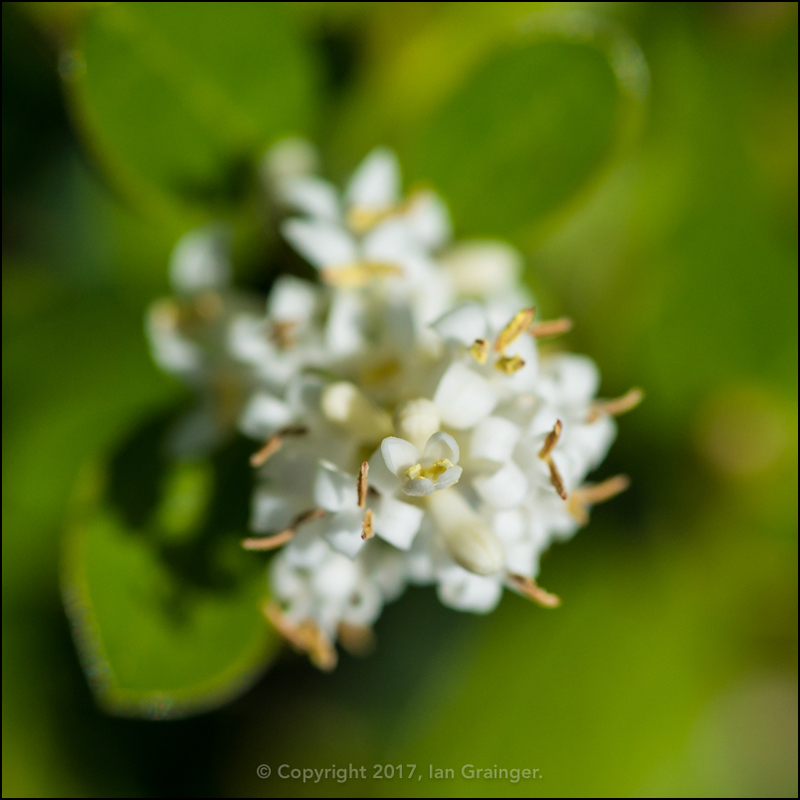 Turning my attention to floral photography, I spotted this pretty Privet hedge blossom. I'm always a bit taken aback when I see these hedges burst into bloom, as they're a lot prettier than you'd expect them to be. 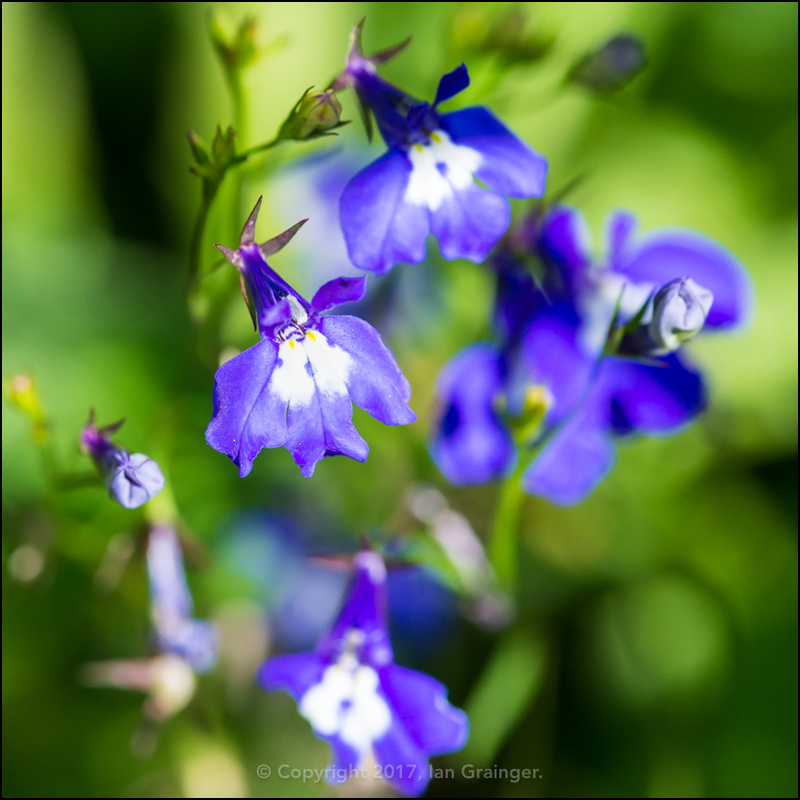 Another little bloom that always outperforms its expectations, in my opinion, is the Lobelia. It looks great in drifts in the border, and even better when cascading from hanging baskets. ...from at least two different colour forms. While my own Dahlias aren't doing too well this year, the one's I gave to dad this year are doing brilliantly. 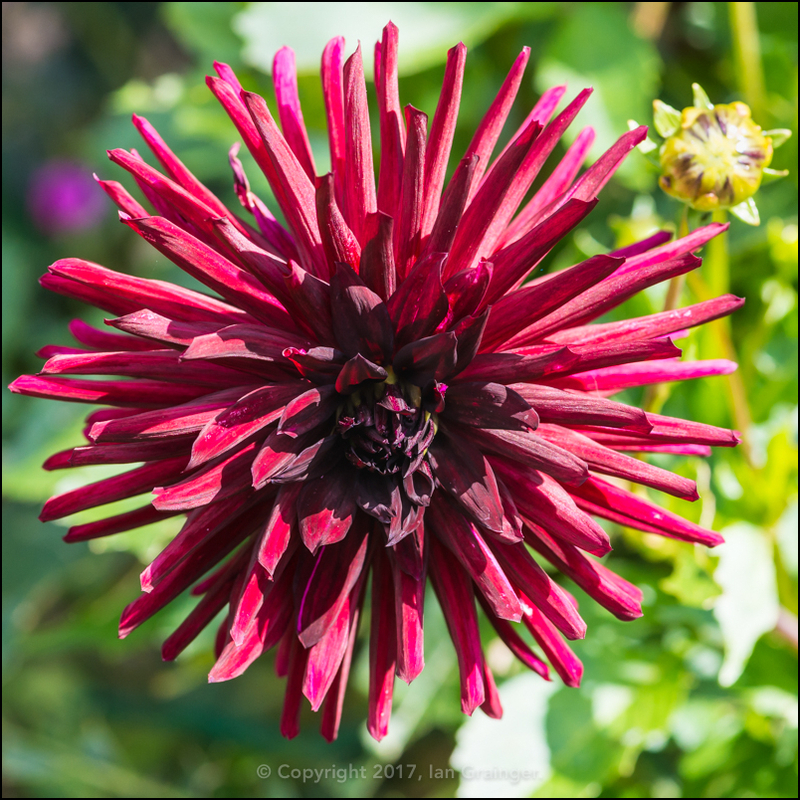 This Dahlia 'Nuit D'Ete' has been the best performer, and has literally dozens of buds still left to open. 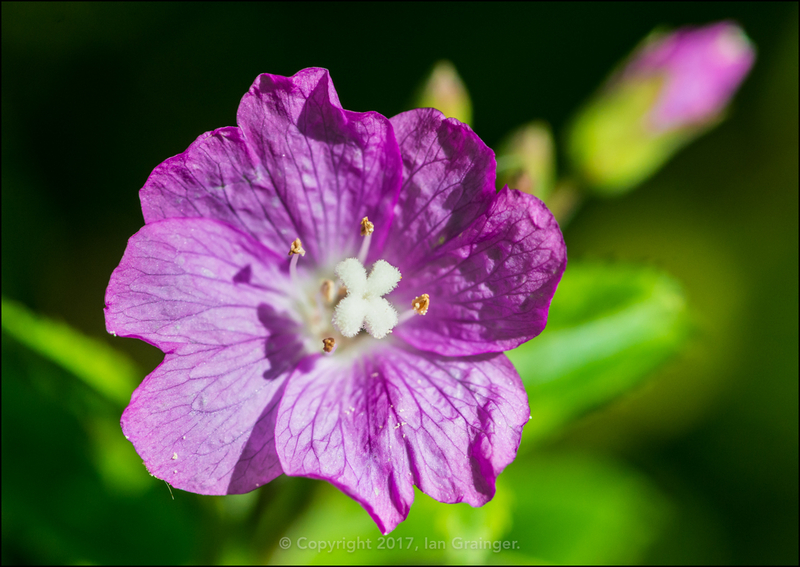 One of my favourite flowers at this time of year are that of the Great Willowherb (Epilobium hirsutum). Yes, they are really classed as weeds, but boy, do the insects love them, and you surely can't argue that they're not pretty. 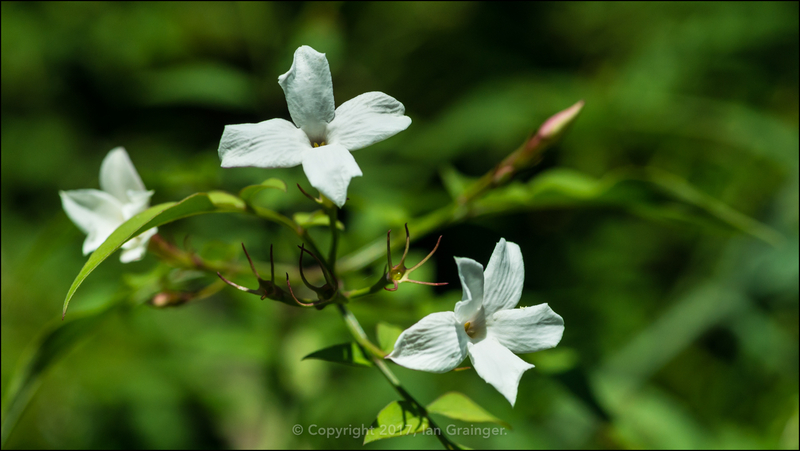 The Summer Jasmine (Jasminum officinale) is starting to get its coat of flowers, although I don't think there are as many flower buds as there have been in previous years. 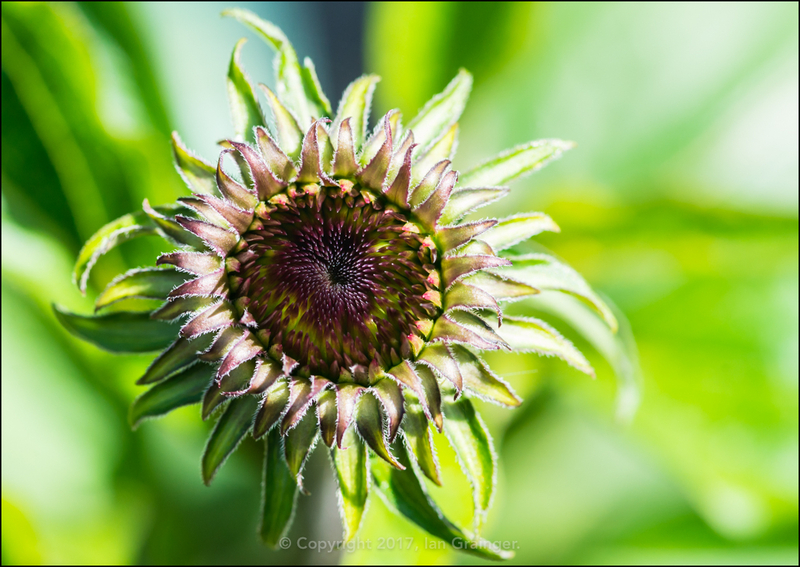 This may be because I gave it a severe haircut at the wrong time, earlier this year! 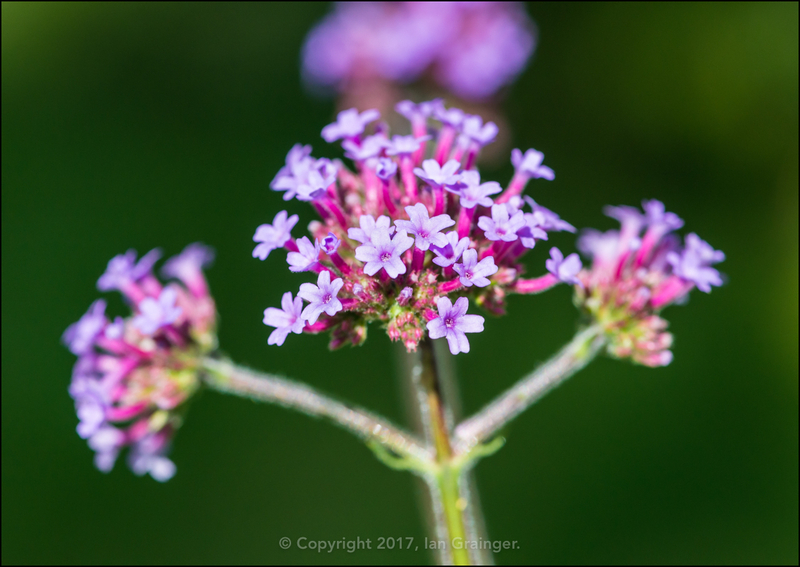 The Verbena (Verbena bonariensis) 'Buenos Aires' is continuing to grow well, although it's not proving as popular with the insects as I'd anticipated. 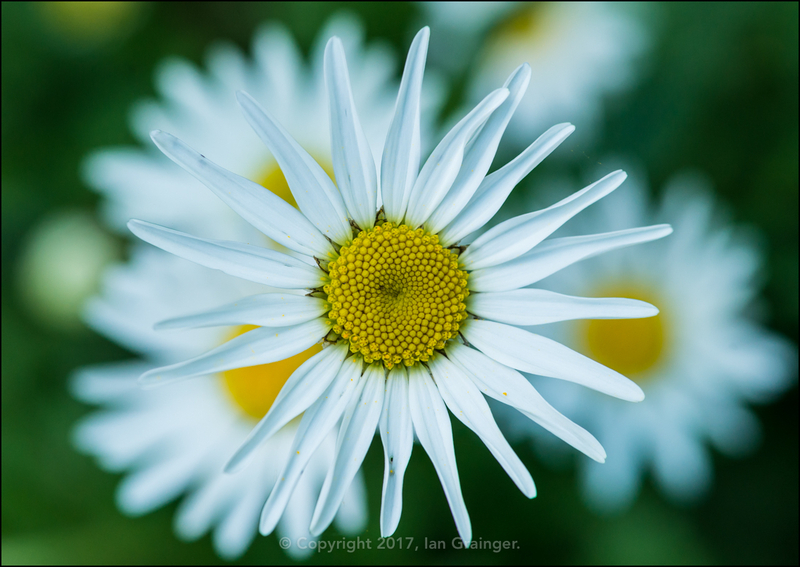 The Oxeye Daisies (Leucanthemum vulgare), on the other hand, have proved extremely popular with all sorts of insect life, and have been ever since late spring. As mentioned earlier, the Hydrangeas are looking at their best at this time of year, with this Mophead variety just starting to come into flower. 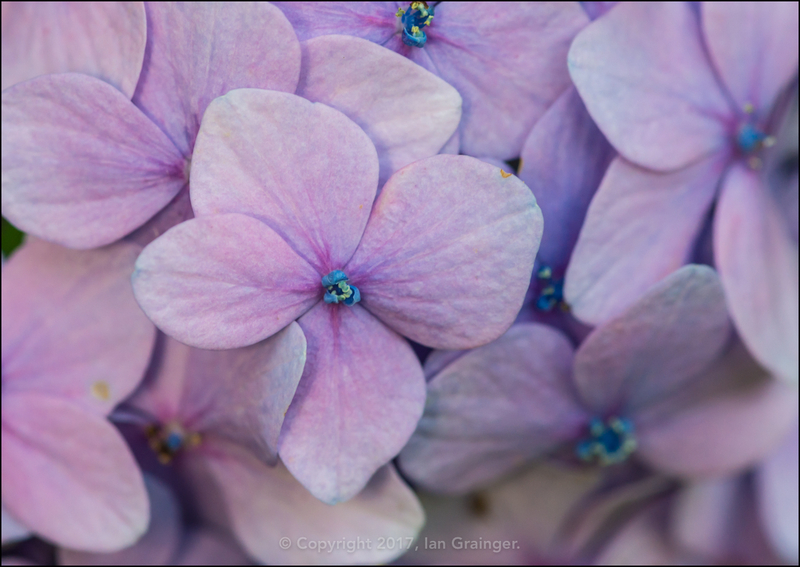 Yes, those tiny blue things in the centre are the actual flower petals, while the surrounding lilac coloured 'petals' are actually modified leaves called Bracts. 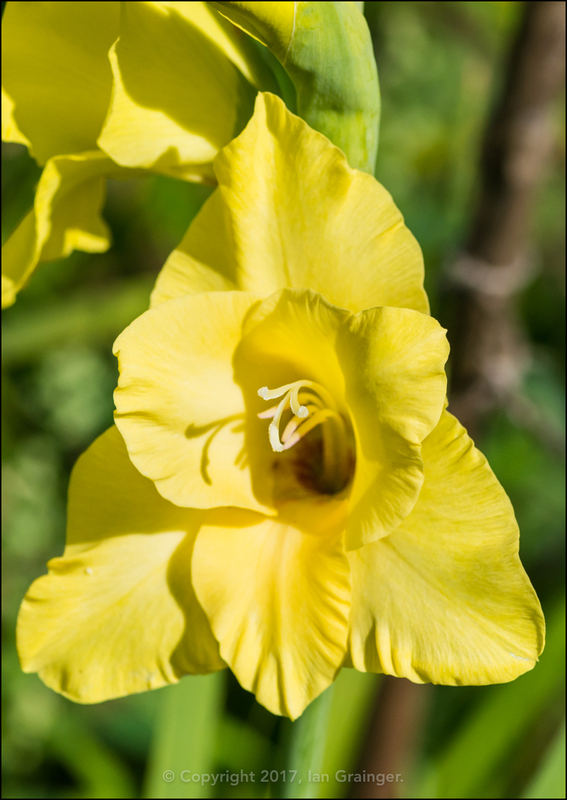 The Gladiolus were also looking their best at this time of year. I only wished they would last a little longer, and were a bit more resilient against wind and rain. 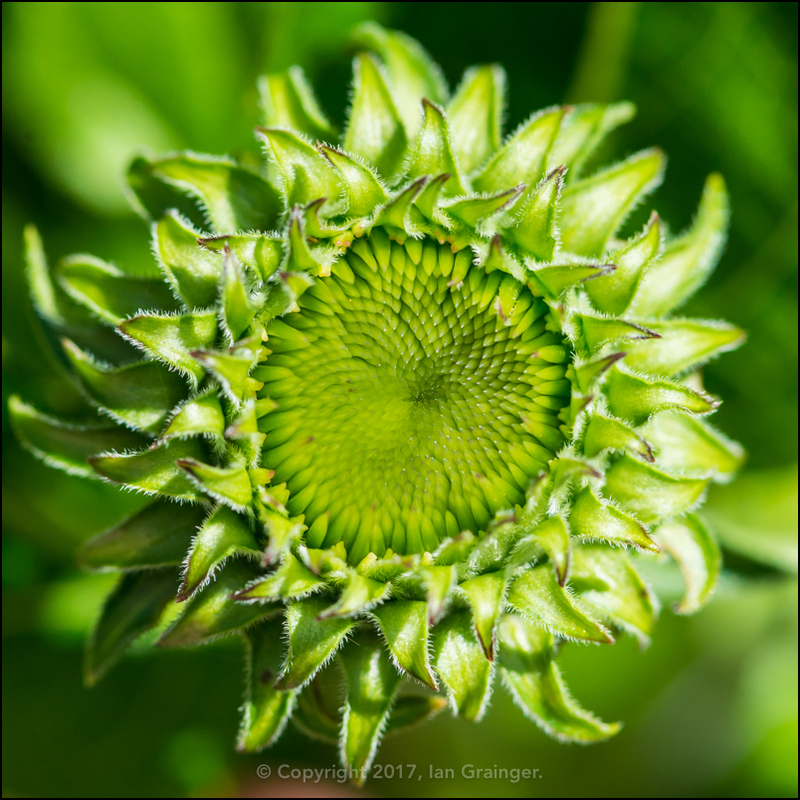 It would soon be turning from summer into autumn, and there were already early indications of this happening. 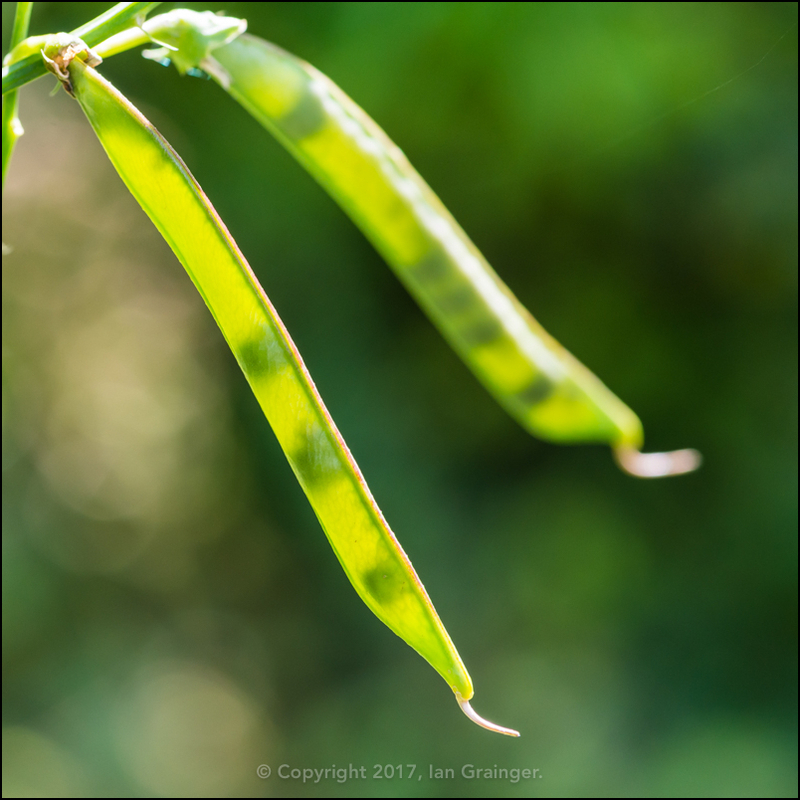 The Sweet Pea (Lathyrus odoratus) plants were already starting to set seed. Finally, here's another attempt at photographing one of my fishy friends. This week I'm showing off Eric again. 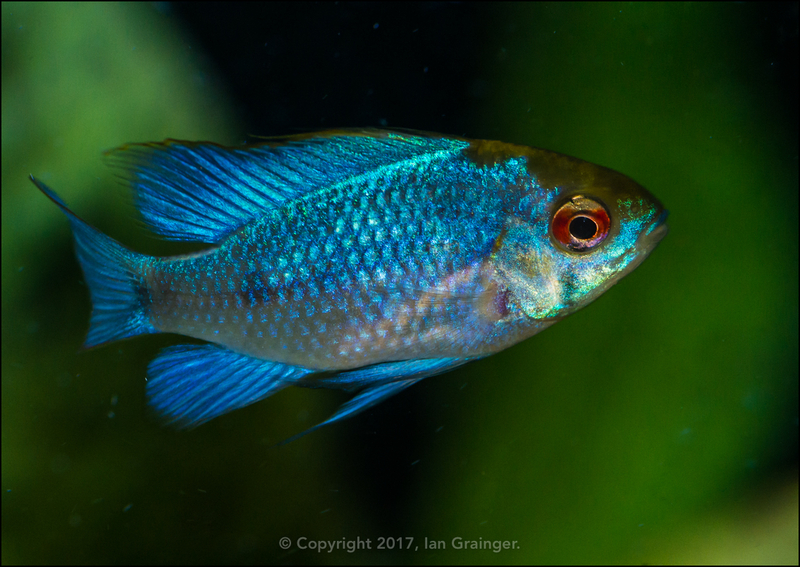 Yes, I've named my Electric Blue German Ram (Mikrogeophagus ramirezi) Eric. He really has mellowed in the few months that I've had him, and has thankfully stopped trying to kill his tank mates. He's now the first fish to come to see me when I go near the tank, and has got begging for food down to a fine art!